Getting her father to take a vacation and stop moping around the Flywheel Café was Delilah’s genius plan. He'd used managing their cafe in Sydney as an excuse to not get way but she assured him that they could manage for a few weeks without him. So when their manager gets deported and Delilah has to start skipping school to take care of the business, she doesn’t have the heart to tell her Dad to come home. He’s having so much fun traveling. Besides, she can keep it going for a few more weeks. But then her dad’s travels take him longer away and things start to go seriously wrong: a competitor is driving them out of business (with the help of a disgruntled ex-employee), Delilah’s inability to cook or manage isn’t helping, and her hopeless crush on a beautiful Flamenco dancer isn’t going much better. 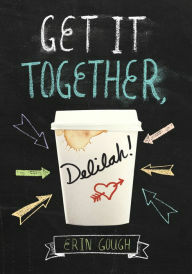 One disaster follows another and everything Delilah does seems to get them into a worse position. Initially, I found Delilah’s character annoying. Her decisions to skip school (driven more by her fear of bullying than the need to keep the restaurant going), lying to her father about what was happening at home, and generally avoiding confrontations was hard to admire. It certainly gave her a lot of room to improve though, so there is lots of personal growth to observe. Over time, Delilah improves and, in all fairness, her character flaws grow more endearing. Beyond that, the oddball collection of characters was compelling enough to keep the story interesting. A glossary of Aussie slang at the end of the book was interesting but largely unnecessary for reading and enjoying the story.